This post contains fun links to some of the best emoticon directories we found including Skype, Slack, and Pokemon Go – who knew! →Why might this make a difference when it comes to social media and marketing? 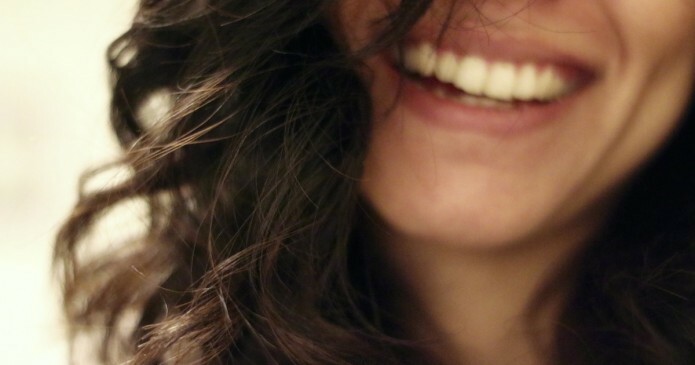 Because human faces are so particularly compelling, attention-grabbing mechanisms. Research shows that experts in a subject matter who use emoticons are perceived as more “friendly and competent” than those who don’t. In most cases, you can create a more positive customer experience simply by dressing up your communication with punctuation. The second email (above) is an excellent example of why overt friendliness works in written customer communications! 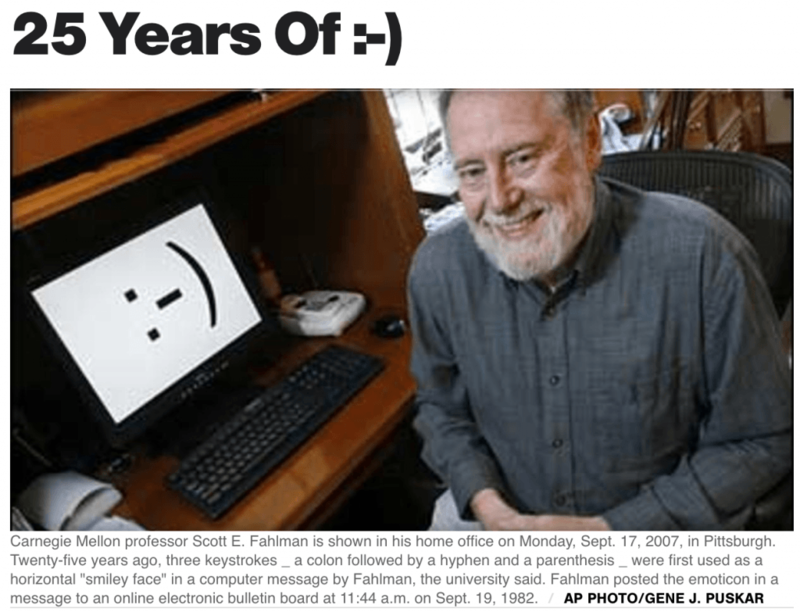 It all started with a simple colon, dash, and bracket used by computer scientist, Scott E. Fahlman back in 1982. He thought it would help people on a message board at Carnegie Mellon distinguish serious posts from jokes. He proposed the use of 🙂 and 🙁 for this purpose, and the symbols caught on. Since then, thousands of emoticons like the smiley face have emerged, conveying a diverse and complex array of emotions and concepts. We’ve written a few posts on how to use emojis and emoticons successfully in business communications and social media. Although they have different history and meanings, we are using the two terms interchangeably. And now, Facebook Reactions (Like, Love, HaHa Wow, Sad, and Angry) give users a quick way to respond to your social media post. With all the new on Facebook, wouldn’t it be nice to bring back some old friends or some secret emoticons? 1 –Facebook Original: Get back your old friends. This Chrome extension brings back the Pacman emoticon (and other original emojis) on Facebook. moment? Sometimes a picture is worth a thousand words! This extension gives you access to all secret emoticons in Facebook comments and posts! Ever wondered how people on your Twitter timeline type things like this? It can range in meaning: “whatever”, “why not”, “who knows”, “doesn’t matter”, “enh”, and almost anything else that’s a quick dismissal. You might not know it’s called the Lenny Face, but you’ve definitely seen it before. This smug little face and its many derivatives — like the “wearing cool shades” emoticon—can often be seen on discussion boards, Reddit, and even Twitter. The Lenny Face originally comes from Japanese forums and is a part of the Kawaii Emoticons trend. Kawaii is Japanese for cute, and the emoticons have a large variety of Unicode characters to show different feelings. In fact, Eastern emojis are different from Western ones, so you’ll also be able to stand out among your friends. Skype emoticons can liven up your instant message conversations, or add them to your mood message to let your friends know how you’re feeling. Select the emoticon you want to use from the palette in the IM window (by clicking on the smiley in the chat window) or use the keyboard shortcut – a set of characters or a particular word in brackets. If you hover over an emoticon in the palette, you’ll see its keyboard shortcut. Hidden Emoticons: You won’t see these secret emoticons on the menu, but if you know the keyboard shortcuts you can surprise your friends with them. Country flags: Flags are a great way of letting people know where you are or where you’re going. Mojis: Mojis are short video clips you can use to express yourself in your instant messages – for those times when words or emojis just aren’t enough. According to Microsoft, it has scoured the archives and handpicked the funniest, craziest, and most iconic moments from some of the best TV and movies out there. Mojis categories currently available include Hollywood, BBC, the Muppets, Bollywood, Angry Birds, Spring and Love. Slack uses the standard emoji codes found at Emoji Cheat Sheet. You can quickly add emoji to your messages by typing in the code. Slack also allows you to create custom emojis for your team! Crestfallen by the lack of a certain emoji? Fret no more: Whatever your emoji needs, your team can make it happen with custom emoji. Unless you’ve been off-planet for the past couple months, you’ve probably heard about the huge success and popularity of Pokémon Go. Not surprisingly, two French designers are working on developing a keyboard of emoticons that allow people to communicate using ‘pokémoji’. The flattened icons, rendered in a simple color palette and illustrated without three-dimensional effects, will bring your favorite comic characters to your fingertips. 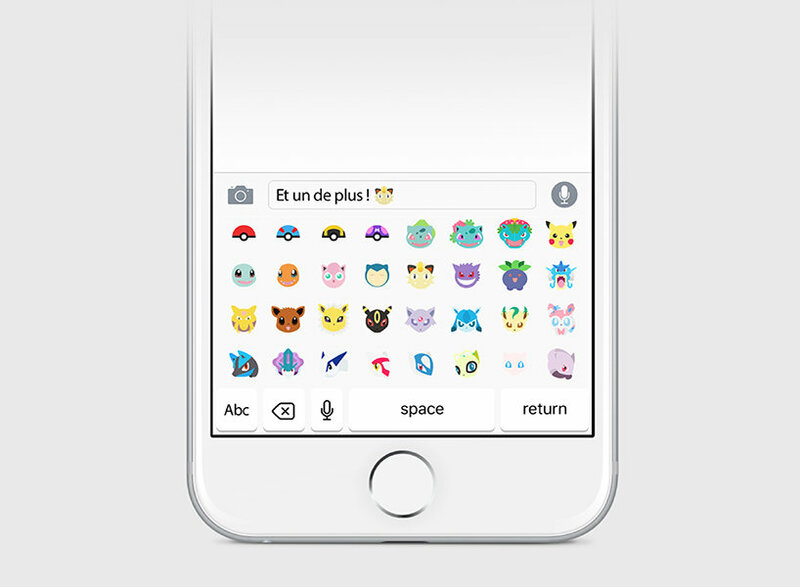 →The pokémoji keyboard will bring the uber popular pokémon emoticon to your fingertips. For now, you can use Insta Emoji for Pokémon Go – Pokemoji Photo Editor Add Cool Emoticon Yellow Stickers to your Photos. What are a few of your favorite emoticons? How about smiley faces or funny emoticons? I’ve shared mine. We would love to hear from you.